Place value on your hard work. Your business provides ongoing income, and is a key contributor to your retirement or succession plan. We believe it’s essential for business owners to know the current value of their business, understand how that value is derived, and execute a plan for maximizing value in the future. This will help set you up for success when it’s inevitably time to cut ties with your business. We work alongside your advisors and our network of experts to produce the optimal scenario for any change or transition your business is experiencing. Whether it’s bringing in an employee as a shareholder, transitioning your business to the next generation, selling it for top dollar, or resolving share value disputes amongst existing shareholders, we overturn the complexities behind the numbers to provide an objective and accurate valuation that focuses on key issues and is communicated in a clear, concise manner. But it doesn’t end there. Our process includes a follow-up meeting to ensure you understand how we valued your business, what key valuation ratios were applied, and what the key value drivers are for your business. Establishing long-term relationships with our clients is important to us. 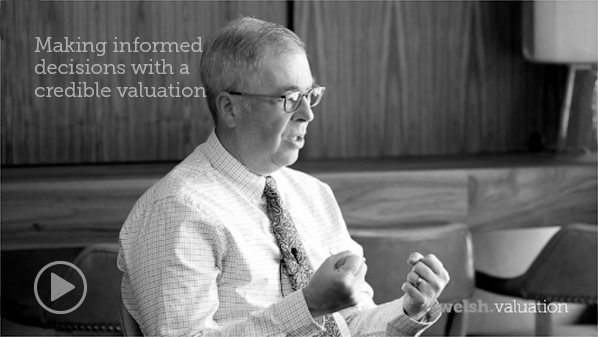 Many of our clients have asked us to undertake business valuations on a regular basis in order to help with long-term strategic decisions and ongoing share transactions. Connect with us for more information. We work with lawyers and businesses/individuals on a variety of litigation matters, and understand the importance of a highly-detailed analysis prepared under strict time deadlines. Copyright © 2019 Welsh Valuation Inc.